Winchester School of the Arts is the Laundromat of East Coast boarding schools. When teens have dropped out—or have been kicked out—of every other reputable prep school, Winchester is where they go. It's also where unsuspecting Carli Gemz, a young actress, is sent by the producer of her new TV show to get some real life experience with boarding school living. What she doesn't know is that she's also being sent there to give the producer's son, Fun, one last chance at redemption before he gets himself kicked out. Both are surprised to find that the school's golden girl, and possibly the most normal person there, Darcy, has gone missing. Carli is intrigued and can't fight the urge to look for her, and Fun is dragged along, making for a humorous and puzzling adventure. 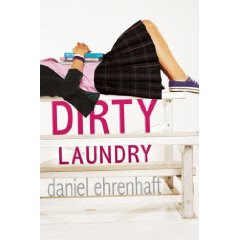 Dirty Laundry is a nicely engaging combination of wit, mystery, and a dash of romance written in the form of alternating narratives between Fun and Carli’s unique voices, which can be a difficult feat, but one that Ehrenhaft pulls off flawlessly. The characters are presented in such a way that everything Ehrenhaft discloses about them—from multiple points of view, their own dialogue, and their actions—only reinforces the genuine vibe Dirty Laundry gives off. The diverse and realistic characters are the key element that grounds the rather far-fetched plot from seeming too cheesy and unrealistic and adds to the quirkiness and overall charm of the entire novel. The seriousness of the missing girl and the possibility that her abductor lives among the teens is carefully balanced by the underlying wit and humor that is present throughout the entire novel. The only deterring aspect of the book was the slightly rushed conclusion, but overall Dirty Laundry is a hilarious and entertaining read reminiscent of the works of John Green and Jaclyn Moriarty's The Murder of Bindy Mackenzie, and is easy for the reluctant teen reader to get immersed into. Ehrenhaft has created a winner. This book will be out in a few days--December 30th, so be sure to look for it.